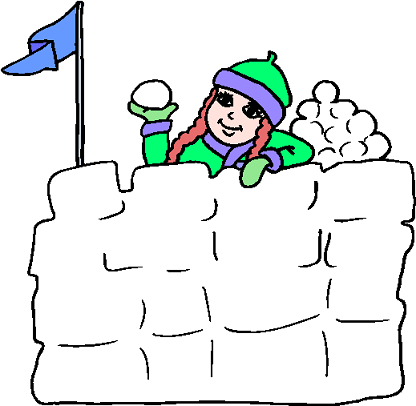 Building a snow fort (also known as a snow castle) is a fun activity when there is snow on the ground. Once you've made the fort, you can use it can be used for pretend games like "house" or "store", but the most fun is to use the fort as a defensive structure in snowball fights. The largest snow fort in the world is the SnowCastle of Kemi in Finland. This fort is actually rebuilt every year (because snow melts), each time to a different design. The largest version of this fort yet built covered 20,000 square meters. The highest walls yet built for this fort. had walls over 20 meters tall. The longest walls yet built for this fort, had walls over 1,000 meters long. Every version has had a SnowRestaurant. Tables and seats in the restaurant are made from ice, but the seats are covered with reindeer fur to make them comfortable to sit on! Each version has had a chapel with between 50 and 100 seats. Couples have even travelled specially to the SnowCastle of Kemi to get married there!